The peach (Prunus persica) is known as a species of Prunus native to China that bears an edible juicy fruit also called a peach. It is a deciduous tree growing to 5–10 m tall, belonging to the subfamily Prunoideae of the family Rosaceae. It is classified with the almond in the subgenus Amygdalus within the genus Prunus, distinguished from the other subgenera by the corrugated seed shell. The leaves are lanceolate, 7–15 cm long (3–6 in), 2–3 cm broad, pinnately veined. The flowers are produced in early spring before the leaves; they are solitary or paired, 2.5–3 cm diameter, pink, with five petals. The fruit has yellow or whitish flesh, a delicate aroma, and a skin that is either velvety (peaches) or smooth (nectarines) in different cultivars. The flesh is very delicate and easily bruised in some cultivars, but is fairly firm in some commercial varieties, especially when green. The single, large seed is red-brown, oval shaped, approximately 1.3–2 cm long, and is surrounded by a wood-like husk. 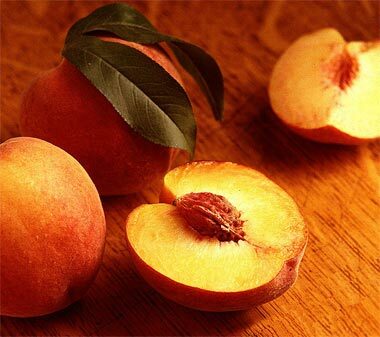 Peaches, along with cherries, plums and apricots, are stone fruits (drupes). The tree is small, and up to 15 ft tall. The scientific name persica, along with the word “peach” itself and its cognates in many European languages, derives from an early European belief that peaches were native to Persia (now Iran). The modern botanical consensus is that they originate in China, and were introduced to Persia and the Mediterranean region along the Silk Road before Christian times. Cultivated peaches are divided into clingstones and freestones, depending on whether the flesh sticks to the stone or not; both can have either white or yellow flesh. Peaches with white flesh typically are very sweet with little acidity, while yellow-fleshed peaches typically have an acidic tang coupled with sweetness, though this also varies greatly. Both colours often have some red on their skin. Low-acid white-fleshed peaches are the most popular kinds in China, Japan, and neighbouring Asian countries, while Europeans and North Americans have historically favoured the acidic, yellow-fleshed kinds. Peaches are known in China, Japan, Korea, Laos, and Vietnam not only as a popular fruit but for the many folktales and traditions associated with it. Momotaro, one of Japan’s most noble and semi-historical heroes, was born from within an enormous peach floating down a stream. Momotaro or “Peach Boy” went on to fight evil oni and face many adventures. Peach flowers are admired by the Japanese but not as much as the sakura (cherry). In China, the peach was said to be consumed by the immortals due to its mystic virtue of conferring longevity on all who ate them. The divinity Yu Huang, also called the Jade Emperor, and his mother called Xi Wangmu also known as Queen Mother of the West, ensured the gods’ everlasting existence by feeding them the peaches of immortality. The immortals residing in the palace of Xi Wangmu were said to celebrate an extravagant banquet called the Pantao Hui or “The Feast of Peaches”. The immortals waited six thousand years before gathering for this magnificent feast; the peach tree put forth leaves once every thousand years and it required another three thousand years for the fruit to ripen. Ivory statues depicting Xi Wangmu’s attendants often held three peaches. The peach often plays an important part in Chinese tradition and is symbolic of long life. One example is in the peach-gathering story of Zhang Daoling, who many say is the true founder of Taoism. Elder Zhang Guo, one of the Chinese Eight Immortals, is often depicted carrying a Peach of Immortality. The peach blossoms are highly prized in Chinese culture. It was in an orchard of flowering peach trees that Liu Bei, Guan Yu, and Zhang Fei took an oath of brotherhood in the opening chapter of the classic Chinese novel Romance of the Three Kingdoms. Due to its delicious taste and soft texture, in ancient China “peach” was also a slang word for “young bride”, and it has remained in many cultures as a way to define young women or a general state of goodness (as in English, with peach or peachy keen). A Vietnamese mythic history states that, in the spring of the year 1789, after marching to Ngọc Hồi and then winning a great victory against invaders from the Qing Dynasty of China, the King Quang Trung ordered a messenger to gallop to Phú Xuân citadel (Huế nowadays) and deliver a flowering peach branch to the Princess Ngọc Hân. This took place on the 5th day of the first lunar month, 2 days before the predicted end of the battle. The branch of peach flowers that was sent from the North to the Center of Vietnam was not only a message of victory from the King to his wife, but also the start of a new spring of peace and happiness for all the Vietnamese people. In addition to that, since the land of Nhật Tân had freely given that very branch of peach flowers to the King, it became the loyal garden of his dynasty. A peach tree is also the context in which Kim Trọng and Thuý Kiều fell in love in The Tale of Kieu. And in Vietnam, the blossoming peach flower is the signal of spring. Finally, peach bonsai trees are used as decoration during Vietnamese New Year — Tết in Northern Vietnam. A medium peach (75g), has 30 Cal, 7g of carbohydrate (6g sugars and 1g fiber), 1g of protein, 140mg of potassium, and 8% of the daily value (DV) for vitamin C.
As with many other members of the rose family, peach seeds contain cyanogenetic glycosides, including amygdalin (note the subgenus designation: Amygdalus). These substances are capable of decomposing into a sugar molecule and hydrogen cyanide gas. While peach seeds are not the most toxic within the rose family, that dubious honor going to the bitter almond, large doses of these chemicals from any source are hazardous to human health. Peach recipe will be soon updated.